Many religious institutes organize street procession which recreates the scene of Lord Shiva going to marry Goddess Parvati. 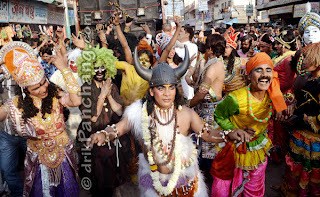 This street procession is famously known as Shiva Barat or Shivji Ki Barat. However Shiva Barat is less common than that of Rama Barat. 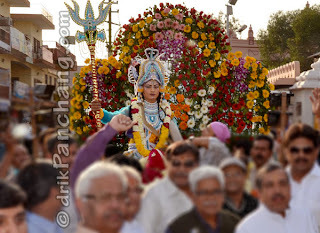 In Mathura, during the auspicious day of Maha Shivaratri, Shri Krishna Janmabhoomi trust takes the procession of Lord Shiva throughout the city with Bandbaja. It is believed that on the auspicious day of Maha Shivaratri Lord Shiva got married to Goddess Parvati and this day is celebrated as marriage anniversary of Lord Shiva. However, Maha Shivaratri is also celebrated as the birth anniversary of Lord Shiva when Lord Shiva was first appeared on the Earth in the form of Linga. Shiva Barat has been described in the Shiva Purana and the procession is depicted according to that description. Lord Vishnu and Lord Brahma apart from God Indra participate in Shiva Barat. Lord Shiva mounts on the Nandi bull and followed by all sorts of ghost and spirits who are controlled by Lord Shiva. Shiva Barat is considered unique and strange due to ghosts and spirits participating in that as family members of Shiva. Participation of such deadly and fearsome entities in a wedding ceremony can be seen only in Shiva Barat.